Gary Ernest Smith, Stone Wall with Cottonwoods, Oil on Canvas, 24" x 30"
Gary Ernest Smith was born in 1942, in Baker City, Oregon, an unassuming town in the rural heart of the Columbia plateau’s high desert that stretches across eastern Oregon, Washington and western Idaho. The rural setting of the Northwest became ground zero for the artwork of Smith. 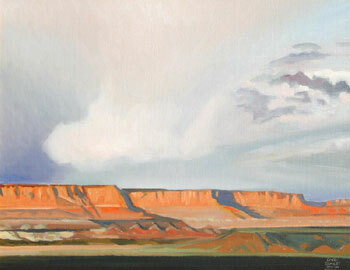 Gary Ernest Smith, Storm Clouds over Mesas, Oil on Canvas, 16" x 20"
Gary Ernest Smith was educated at Eastern Oregon College and Brigham Young University—earning both a bachelor’s degree and a master’s degree in fine arts. Still, formal education alone did not fuel Smith’s artistic development. Before entering college, he spent much of his childhood working on drawings and paintings. Throughout his education and his career, Gary Ernest Smith has had the opportunity to travel and study the works of European masters and Russian painters. Smith cites Maynard Dixon as the artist that was most influential in the development of his own painting. Gary Ernest Smith, Canyon View, Oil on Linen, 30" x 24"
Although his studies and experiments were extensive, Gary Ernest Smith is most often labeled a regionalist drawing comparisons to such artists as Thomas Hart Benton and Grant Wood. The work of Gary Ernest Smith reflects the artist, expressive but humble, and is grounded in the rural and religious. The social commentary is a sturdy hymn of the beauty of hard work, a lament for a way of life that is at risk of fading away, and the beauty that exists in everyday scenes—not just the extraordinary. 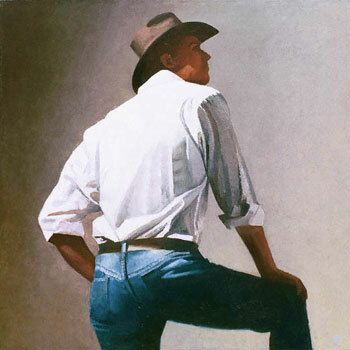 Gary Ernest Smith, Contemplative Man, Oil on Canvas, 48" x 48"
Currently, Gary Ernest Smith resides in Utah. Highlights of his professional career include three terms as director of the Brigham Young University art gallery, numerous one-man shows and traveling exhibits such as the “Third Western States Traveling Exhibit,” sponsored by the Brooklyn Museum of Art. The exhibit of Smith’s series, “Journeys in Search of Lost Images,” traveled to twenty-two museums around the United States, and his one-man exhibit— “Fields” paintings- showed both at The Museum of Fine Art at Brigham Young University and the Eiteljorg Museum in Indianapolis. Springville Museum of Art, Springville, UT, 1982-83, 88-89, 92-93, 95. Southwest Art, August, 1984, Gary E. Smith, Rooted Substance and Surface, Vern G. Swanson, pp.42-48. Midwest Art, July-August, 1985, Gary E. Smith, Visions of Yesterday, James Thornton, Cover and pp. 18-23. San Diego Tribune, March 26, 1985, Impressions of Rural America, Works by Gary E. Smith, Jan Jennings. Art Gallery International, July-August, 1986, Gary E. Smith, Sandy Preston, pp.22-29. Western Art Digest, July-August, 1986, Gary E. Smith, Renee Hooley, pp. 92-97. The Phoenix Gazette, Marquee, Cover, March, 1987, Down on the Farm with Gary Smith, Lynn Pyne, pp. 34. Scottsdale Progress, Weekend, March 27, 1987, Art Critic Joseph Young. Art Today, Winter, 1987-88, Gary E. Smith, The Melding of Body and Soul, Ann Wilson, pp. 38-42. Phoenix Home and Garden Magazine, January, 1988, Studio, Six Artists to Watch in 1988, Susan M. Bryan, pp. 34. Third Western State Exhibition Catalog, Soft and Hard Cover, text by Charlotte Kotik, Curator of Contemporary Art, The Brooklyn Museum, NY. Art Aid Catalog, Sotheby’s Auction House, Hard Rock Café, NY. Art Talk, June-July, 1989, Gary Ernest Smith, Few People Ever Find the Rainbow, Danny Medina, pp. 24-25. Southwest Art, March 1991, Gary Ernest Smith, Lynn Pyne, pp. 60-66. A Design Manual, Shiri Brainard, 1991, Prentice Hall, pp. 73. Utah Art, Vern G. Swanson, Robert S. Olpin, William c. Selfrit, Gibbs Smith Publisher, Gary Ernest Smith, pp. 194-95, 208, 218, pl. 89, 1991. Being An Artist, Lewis Barrett Lehrman, 1992, Northlight Books, Gary Ernest Smith, Know Your Strengths, pp. 22-27. Southwest Art, May, 1992, An Artist’s Passion, Gary Ernest Smith, Comic Capers, p. 62. InformArt, May-June, 1992, Suddenly—It’s Another Time, Another Place, Leslie Marchando, pp. 14-17. Art: Do It! A Handbook for Artists, 1996, Peter Livingston Myer, Kendall-Hunt Publishing, Gary Ernest Smith, p. 4. Leading the West, One Hundred Contemporary Painters and Sculptors, 1997, Donald J. Hagerty, Northland Publishing. 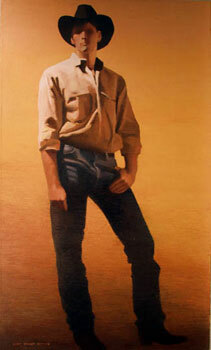 Southwest Art, February, 1998, Lynn Pyne, pp. 74-79. Arizona Republic, April 5, 1999, Kyle Lawson, pp. 14-17. New West, August, 1999, Emil Call. Southwest Art, October, 1999, Donald J. Hagerty, pp. 30-32. Indianapolis Star, November 14, 1999, Steve Manheimer, p.16. Focus Santa Fe, Oct-Dec., 1999, Redefining the Contemporary American West, Diane Cauble, pp. 20-23. 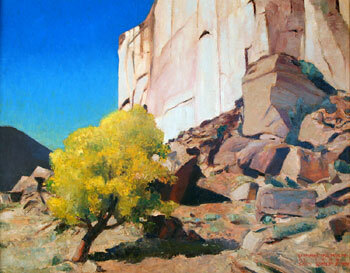 Southwest Art, March, 2000, Bonnie Gangelhoff, p.68. Art of the West, Nove-Dec., 2000, Nancy Gillespie, pp. 22-24. Deseret News, Dec. 31, 2000, Holding Ground: Book Review, Dave Gagon, p.E-5. ArtTalk, February, 2001, John Jarvis. 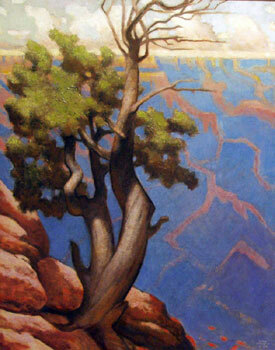 Southwest Art, March, 2001, Bonnie Gangelhoff. Holding Ground – The Art of Gary Ernest Smith, 1999, Donald J. Hagerty, Northland Publishing. The Hadley Companies, 8’ Bronze, Man Lifting Sack, Bloomington, MN, 1990. Springville Museum of Art, 8’ Bronze, Man Lifting Sack, Springville, UT, 1992. City of Metropolis, 15’ Bronze Superman, Metropolis, IL, 1993. Bradley State Park, 15’ Bronze, Owen Bradley, Nashville, TN, 1999. Gary Ernest Smith, The Seasoned Man, Oil on Canvas, 60" x 36"